As many as 39 people have been killed and up to 50 wounded in a reported suicide car bomb blast that ripped through a busy market on Sunday in Mogadishu, Somalia, Reuters reported citing a local official. 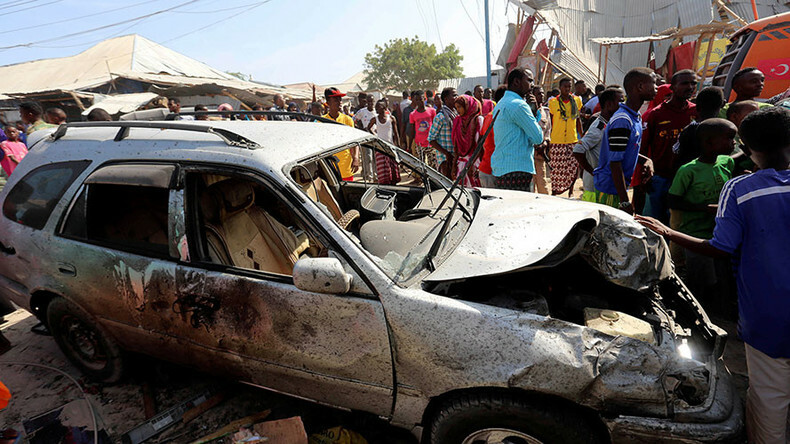 According to the mayor of the Wadajir district, Ahmed Abdulle Afrax, the car was driven by a suicide bomber and exploded near a busy intersection in the area where many people were gathered at about 1.30 pm local time. "We carried 39 dead bodies and there were many others injured," Dr Abdikadir Abdirahman, director of the Aamin Ambulance Service, told Reuters. Many outlets had conflicting reports on the scale of the death toll, with some quoting a figure of more than 40 people dead. "I was staying in my shop when a car came in into the market and exploded," witness Abdulle Omar told Reuters. "I saw more than 20 people lying on the ground. Most of them were dead and the market was totally destroyed." “The area was a busy intersection alongside the road and there were many civilians when the blast occurred," security official Mohamed Jilibey was cited as saying in a separate account that reported a death toll of just 20 people. "Someone had parked the car here and left before it was detonated," local butcher Mohamed Haji told AP in another report. Islamist group Al-Shabaab carried out a number of mortar attacks following the election of new president Mohamed Abdullahi Mohamed last week. The group has not immediately claimed responsibility for the attack. The group described the new Somali leader as an “apostate,” on Sunday and has vowed to continue fighting the government.